"Sure would be nice to have a mother somebody liked." Terms of Endearment made its mark on the American cinema in 1983, garnering five Academy Awards®, including Best Picture. The story concerns Emma (Debra Winger), a young wife and mother of three whose relationship with her own mother, Aurora (Shirley MacLaine), has always been... difficult. Her philandering English professor husband (Jeff Daniels) sends Emma into her own affair with a soft-spoken banker (John Lithgow). Meanwhile, Aurora finds new energy with her next-door neighbor, astronaut Garrett Breedlove (Jack Nicholson). When Emma's doctor finds suspicious lumps under her arm, disruptive and difficult changes affect everyone in her extended family. Director James L. Brooks strikes and maintains a difficult balance here, finding humor in a story that's not inherently "funny" in the traditional sense. Brooks adapted the screenplay from Larry McMurtry's novel, and his script pulls no emotional punches, acknowledging the darker elements of the book without being overwhelmed by them. The characters seem genuine, and our resistance to their less attractive traits is soon overcome by their recognizable humanity. The film benefits from strong, intelligent performances all around. Debra Winger's character matures visibly, developing an inner strength not foreshadowed by her girlish goofiness at the film's outset. Jack Nicholson is in fine, sardonic form as a decaying, womanizing astronaut, improvising some of the best lines in the picture. Jeff Daniels is surprisingly sympathetic as a cheating spouse unsure of his family's future, John Lithgow contributes yet another strong character performance, and Danny DeVito is memorable in a small role as one of Aurora's unsuccessful suitors. But the most impressive screen presence is that of Shirley MacLaine's Aurora, an uptight, emotionally tense woman who seems incapable of truly connecting to anyone; it's amazing to watch her blossom after she meets precisely the wrong sort of man. MacLaine's gestures, facial expressions, and line deliveries are so subtle and so perfect that they seem invented on the spot, yet uniformly "right." Terms of Endearment is as close to perfect as drama gets. Even the illness that drives the third act is credible—its appearance is sudden, but not manipulative; in many ways, Emma's tragedy is what makes the story significant as a whole. Everything that we've learned and come to understand about the characters comes to mean so much more. Sadness and joy combine and commingle, enhancing each other without ever clashing. Terms of Endearment pulls it off, and then some. Image Transfer Review: Paramount presents Terms of Endearment in its original 1.85:1 widescreen theatrical aspect ratio, with a solid anamorphic transfer. The 1983 movie looks a little soft, particularly during the opening credits, but the source print is clean with just a few dust flecks here and there. The digital transfer is superb, handling the film's subtle grain with no distracting artifacts, and detail, black level and color are consistently rich and solid. A few minor moire effects aside, this is an excellent DVD presentation. Audio Transfer Review: Paramount provides a restored monophonic English soundtrack, a Dolby Digital 5.1 remix, and a French mono track to boot. The engineered 5.1 track is conservative and respectful of the original mono mix, spreading the audio subtly across the front soundstage and only reaching aggressively into the surrounds to emphasize a few key emotional moments. The restored mono track sounds clean and clear; the French track is comparatively noisy and muddy despite its "studio" character. Michael Gore's famous musical theme is well-rendered here, though bass activity is minimal; dialogue clarity is more critical to the experience, and both English tracks deliver. Director James L. Brooks, Co-Producer Penney Finkelman Cox and Production Designer Polly Platt contribute a running commentary track. Brooks prefaces his remarks with a casual disclaimer of sorts, then proceeds to prove himself wrong with openness, honesty and entertaining anecdotes about the production, including his own errors, borrowings and dealings with temperamental stars. Co-commentators Cox and Platt help jog and edit Brooks' memory, but the director dominates the discussion, and his insight into the production's constant "struggle for the jokes" is fascinating. The track goes quiet more frequently as the film goes on, but this is an entertaining and interesting track overall. 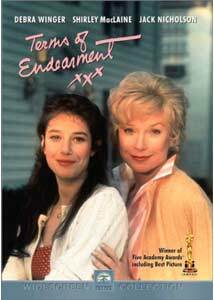 Terms of Endearment remains a finely-crafted, subtly-acted drama that comes by its humor and its pathos honestly. Paramount's DVD features a superb transfer and an insightful commentary track. Recommended.